....and all of a sudden, after all the planning, all the considering, all the writing in the Big Book Of Florida, we've been there, done that. We're home again. And any one of you who knows anything about Orlando is already saying - they haven't really done it, not in one trip. And that would be right. It feels like we only ran a fingernail over the surface and scratched away a little of the top layer. It's a big place. A different kind of holiday for us - less of the history, more of the hysteria - bigger, brighter, faster, hotter, a surprise round every corner. It was a holiday full of discoveries. - we realised, to our delight, that the brand new Diagon Alley attraction at Universal studios wasn't nearly as busy as we'd been expecting. We'd been planning on avoiding the queues by giving it a miss, to be honest, but we got lucky with our timing, and loved it. 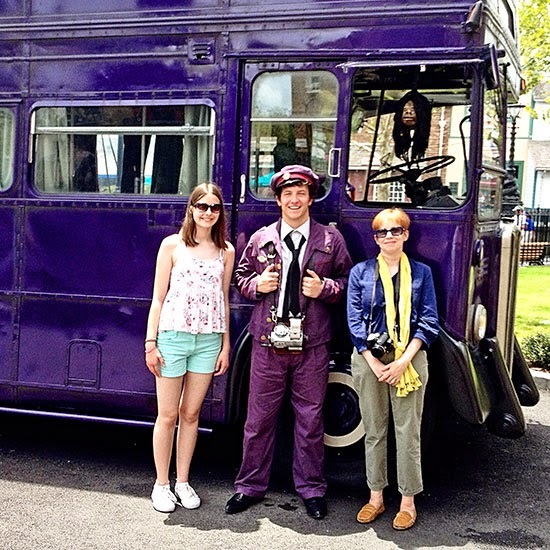 here we are with the Knight Bus and its conductor, Stan Shunpike. 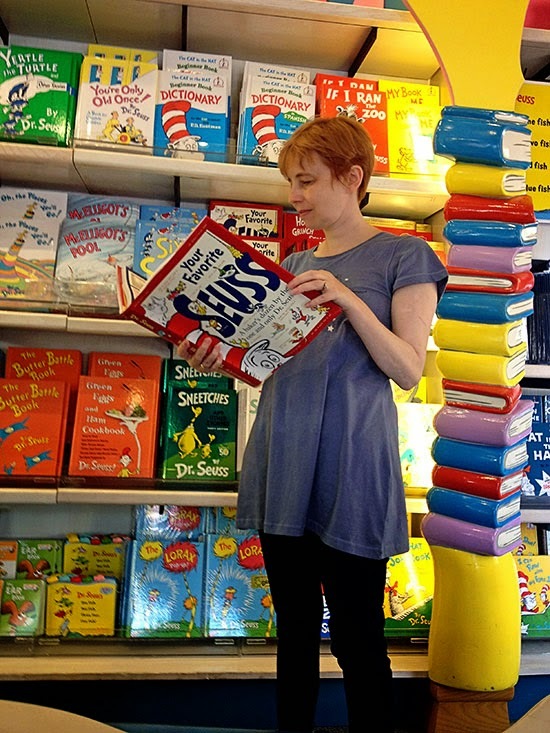 The talking Head actually talks: as I stood there he shouted "look at that lovely red hair". Could have been worse. Could have been look at those roots.. This is only the first of my Seuss photos. Of course I loved it. Of course I have more. - We were surprised by the rain. We'd been told to prepare for it, but, honestly it rains at home all the time. We thought we knew about rain. Ha! Turns out we are amateurs. Orlando rain is a-mazing: very hot, very wet and with lots of very exciting thunder. But my favourite surprise of all? Told you I loved Seuss. All of these pictures, except the first, were snapped by The (Not So) Small One who was cleverly using her phone to get right to the moment while I tried to get my camera out of my bag.. It's good to be back! I've been catching up with what has been happening in the blogging world just as fast as I can - it's such a pleasure to see lots of pictures of the postcards pile up! - and I'll be around again on Monday for "Me on Monday", with thanks to everyone who kept it going while I was away. Talk soon? It's good to know that you had a wonderful time. Too bad about the rain, but it is a staple of summertime Florida. Perhaps another contrast between English rain and the Florida variety is that most of the time there's 20-30 minutes of intense rain in late afternoon and then everything dries up--that's been a little iffy this year though, with longer rainy periods. Good to know, as well, about the Diagon Alley addition. We haven't seen the original Harry Potter attractions yet--it sounds like it would be worth a ride one of these days. Welcome home. 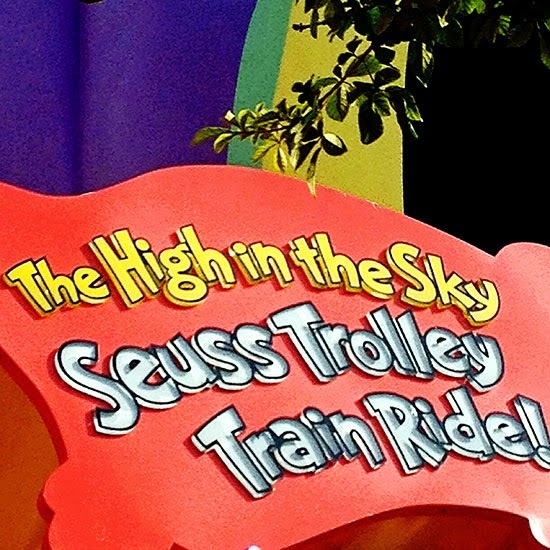 How cool is the name of that ride? Love it and Dr. Seuss, of course. Here's a funny coincidence. My brother was over there at the same time as you. You might have passed each other somewhere. Ooh ~ looooved seeing these photos....& the Harry Potter thing looks super fun:) Great photos by the Young'un, too....& go Seuss, go!!! Glad you are all home safe and sound. Sounds like tropical rain - we get that here, well, not in our part of the country but I have experienced it on numerous occasions and I know exactly what you mean. Glad you dad a fun time...it's one of those places you need to re-visit many times to see it all! It sounds like it was a definite change of pace kind of holiday for you. Glad you enjoyed it and are back home safely. I love Florida!!!! Your post made me smile! Sounds like a super cool trip! Can't wait to see the layouts! Is bit corny to say oh the places you'll go! Disney/Orlando is our family's favorite vacation destination. 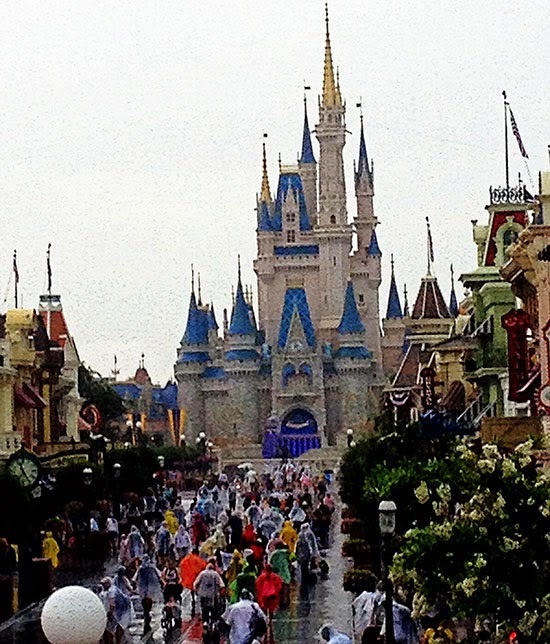 In fact, we're going next summer to experience the new Princesses kingdom. That Dr. Seuss book is perfect for you!! Which came first??? Welcome home. I am looking forward to pages and more posts about your adventures and I absolutely love Dr Seuss - always such words of wisdom. Glad you had a fun holiday - love the photos and looking forward to seeing how you scrap them! I have to agree you've barely nicked the surface of Orlando. We've been 6 or 7 times already. Discovery Cove was a family favorite. And it's a fun but absolutely EXHAUSTING type of vacation. Lots of go, go, go, do, do, do, see, see, see and almost zero relaxation factor! So pleased you had such fun...Orlando certainly is a thrill a minute...the sort of holiday that needs a holiday to recover from!! Great to know that you had a fab time. Pleased about your visit to HP ~ ours was of nightmarish proportions last summer! Welcome back! Love the fist photo, and, oh my, she is getting so tall! Glad you had a good time! 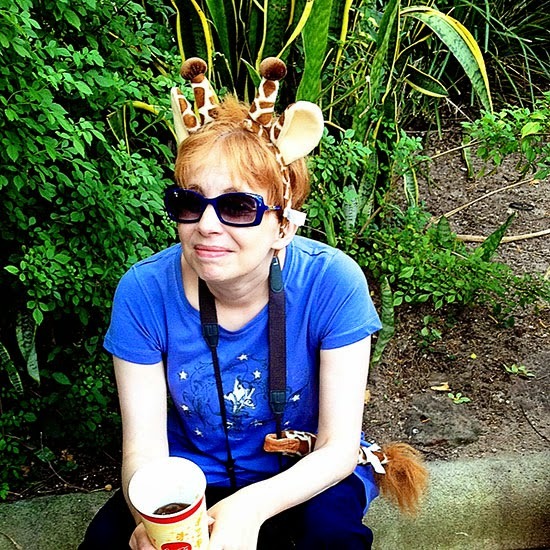 I particularly love your giraffe ears! It looks like you had an amaaazing time! Looks like you had a lot of fun. We made just one trip to Orlando when our kids were growing up--now 21 years ago. I was totally surprised to discover how much I enjoyed it---particularly Epcot. And yes, I do remember to sudden and awesome thunderstorms we had nearly every afternoon. A few years ago, we went to Disneyland in California with both kids as adults, and again I was surprised at how much fun we all had. In a few years, it will be time to try again with grandchildren! That last photo has me smiling - brilliant shot. And it's good to hear, and see, what a splendid time you have all had together, despite the vagaries (or perhaps enjoyment!) of the weather. So glad y'all had a great trip! We're thinking about a trip to Orlando in November so we can visit Harry Potter World. Your pictures are so FUN - great job by the (not so) small one!